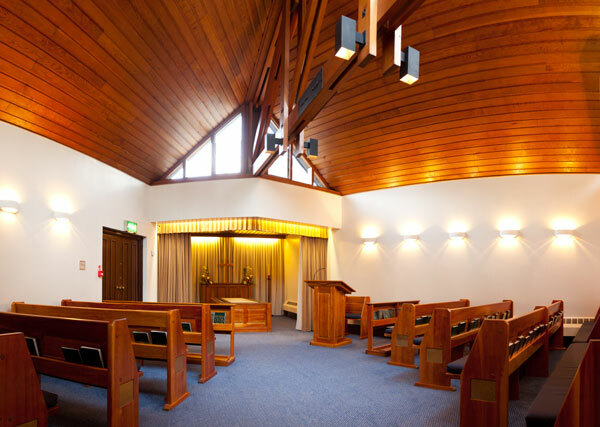 West Herts Crematorium oﬀers a choice of two chapels for your funeral or memorial service. We cater for both religious and non-religious services. The décor in both chapels is designed to create a comforting surrounding as friends and family join together in remembering and celebrating the life of a loved one. The areas outside the chapels have also been attractively landscaped to promote quiet contemplation and remembrance. The North Chapel is West Herts Crematorium’s original chapel, built to serve the community in 1959. It is the larger of our two chapels, accommodating up to 130 people. The space within this Chapel incorporates a balcony, which allows for a large number of guests while retaining a very comfortable atmosphere. At the centre of the chapel lies the stone catafalque on which the coﬃn is placed during the service. This is surrounded by plants that, at seasonal times, present magniﬁcent ﬂoral displays. The South Chapel is particularly suited to more intimate gatherings; it has been designed to seat up to 50 people. 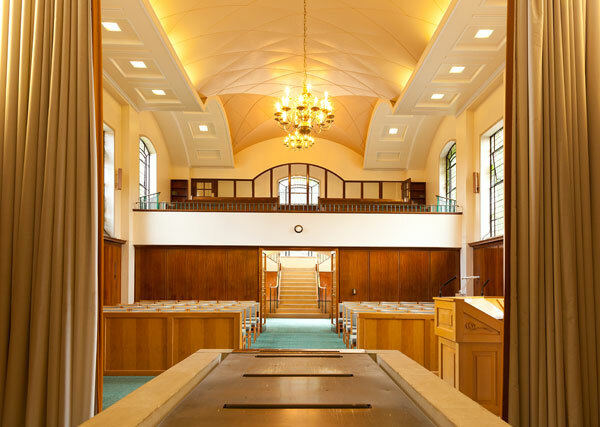 The South Chapel was added to West Herts Crematorium in 1977, and its cherry wood ceiling and pews help to create an atmosphere of warmth and dignity. Our organists are available to play classical music or to accompany hymns in either chapel. They will also play music of your choice from our extensive digital library. Both chapels are ﬁtted with an induction loop system that can help those with hearing diﬃculties.